Tarring and Feathering was a punishment that went back to the Middle Ages with Richard the Lionhearted and the Crusades. The first record is in 1189. Richard ordered that any robber voyaging with the crusaders “shall be first shaved, then boiling pitch shall be poured upon his head, and a cushion of feathers shook over it.” It was not used extensively until the American colonists revived the punishment in the 1760s. Patriots used it against British officials and loyalists in the American colonies. In the spring of 1766 Captain William Smith came under suspicion as an informer of American smuggling activities. He experienced first hand the tar and feather. In retribution, John Gilchrist, a Norfolk merchant and shipbuilder and several accomplices captured Smith and, as he reported, "dawbed my body and face all over with tar and afterwards threw feathers on me." Smith's assailants, which included the mayor of Norfolk, then carted him "through every street in town," and threw him into the sea. Fortunately, Smith was rescued by a passing boat just as he was "sinking, being able to swim no longer." 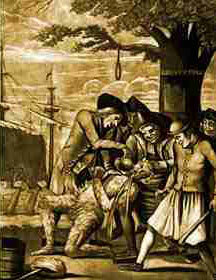 This may have been the first tarring and feathering in America. After the enactment of the Stamp Act, it was common to threaten or attack British government employees in the colonies. No stamp commissioner or tax collector was actually tarred and feathered but by November 1, 1765, the day the Stamp Act tax went into effect, there were no stamp commissioners left in the colonies to collect it. Tarring and feathering was successfully used as a weapon against the Townshend Duties (including the tea tax which led to the Boston Tea Party). In Parliament they hotly debated how best to punish the Bostonians. one member argued that "Americans were a strange set of people, and that it was in vain to expect any degree of reasoning from them; that instead of making their claim by argument, they always chose to decide the matter by tarring and feathering." Fearing that the practice was getting out of control and was harming their image, Boston leaders called a halt to the practice. Elsewhere in the colonies, it persisted as a way to intimidate and punish loyalists. In this excursion, among other plunder, we took a store of molasses, the hogshead being rolled out and their heads knocked in, a soldier’s wife was stooping to fill her kettle, a soldier slipped behind her and threw her into the hogshead ; when she was hauled out, a bystander then threw a parcel of feathers on her, which adhering to the molasses made her appear frightful enough;–This little circumstance afforded us a good deal of amusement.